Police at Peñuelas Valley Landfill. 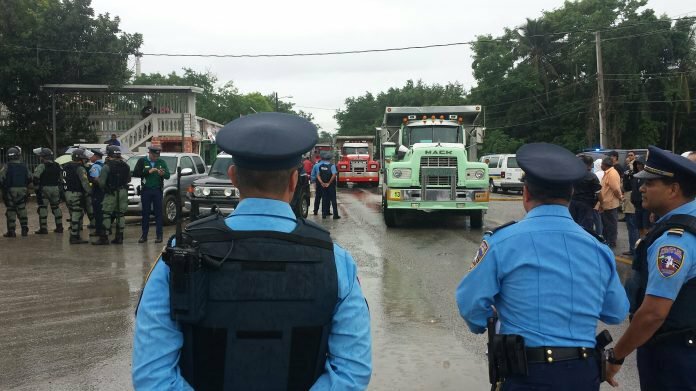 - Police present in manifestation at Peñuelas Valley Landfill. March against the carbon ash deposites. - A march of protestors against the ash deposits in Peñuelas. Arrest in manifestation. 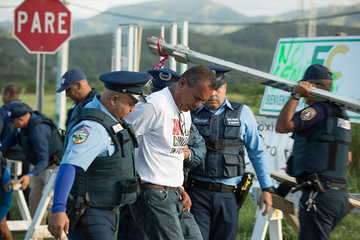 - Protestor being arrested at manifestation in front of Peñuelas Valley Landfill. Maria de Lourdes in the blockad at the PVL manifestation. - Maria De Lourdes, candidate of governance, sitting in the blockade at manifestation. She was arrested that day. Protestors bloquing the street to Peñuelas Valley Landfill. - Protestors laying down on the street entrance to Peñuelas Valley Landfill to prevent the entrance of carbon ashes. Prostesters at manifestation against ash deposites. - Protester with a banner saying "Stop. No more ashes" with their faces painted like skulls. Applied Energy Systems (AES), an electrical energy production company, is producing large amounts of toxic coal ashes. People complain and demonstrate. Applied Energy Systems (AES), which is an electrical energy production company, signed a contract with the Electrical Energy Authority in Puerto Rico (AEE) known as the Power Purchase and Operating Agreement, which states that the AEE will buy coal based electrical energy for 25 years since the beginning of their operation in Guayama, Puerto Rico in the year 2000. The waste this power plant generates are fly and dry ash. The Power Purchase and Operating Agreement stated that these residues cannot stay in Puerto Rico for more than 180 days. The waste was used as construction and agriculture aggregates named Agremax, and some wastes not used for this product were exported to Arroyo Barril, Dominican Republic, where 27,000 tons of rock ash were deposited. The population around these deposits started to witness abortions spikes and respiratory problems. AES was sued by the Dominican Republic government and paid $6,000,000 to settle the lawsuit. Currently AES doesn’t export the wastes to Dominican Republic. This company generates 400 to 1600 tons of coal ash daily. They have a revenue of approximately 1 million dollars by selling energy to AEE. The company generates 15% of the country's energy. Since the Board of Environmental Quality (JCA) considers these ashes nontoxic, over 2 million tons of the residues have been used in different parts of the island for construction purposes known as Agremax. The Environmental Protection Agency (EPA) studied the leaching behavior of Agremax and found that it releases highly toxic heavy metals like beryllium and arsenic which can lixiviate into the ground and contaminate underground waters by movement in the phreatic level and reaching any aquifers contaminating them. In August 18, 2014, EPA made it clear to AEE that the AES can dispose their coal residues in landfill in Puerto Rico. Several lawsuits were made to prevent the deposits of these wastes, but only the municipality of Peñuelas could make a municipal ordinance to prevent the deposits of these coal residues in any form, either for construction or dumping. This made it possible for the municipality of Humacao to apply the same ordinance. AES sued the municipalities of Humacao and Peñuelas stating that the municipal ordinance of denying the coal ash deposits where anticonstitutional, but the Federal Court of Puerto Rico concluded that the municipal ordinances are valid. In April 2015, EPA created a new regulation that applies to the coal ash residues considering it a nontoxic solid waste. The management standards for these residues is minimal. The ashes started to be deposited in Peñuelas Valley Landfill (PVL) since the year 2015 causing protests in front of PVL. Considering that EPA classifies the ashes as nontoxic, JCA approved the deposits in El Coqui Landfill in Humacao (ECL) and PVL. This started protests in Peñuelas where residents close to the PVL and environmental and social activist mobilized themselves to the entrance of PVL preventing the entrance of theses ashes. PVL sued some of the protestors and accused them of public nuisance. Students of Bioestadisticsfrom from the University of Puerto Rico, Medical Sciences Campus, made a study comparing people who lived in places where there’s coal ash exposure and people who weren’t exposed to these ashes to see the difference of disease prevalence. Places with these coal residues have high disease rates compared to places where there were no ashes. Other studies have been done to see the effects of these coal wastes generated by coal burning, mostly calling them toxic, but EPA and JCA haven’t recognized theses studies which is why these too entities consider them nontoxic. The House of Representatives of Puerto Rico have issued a resolution for the use and management of the carbon ashes AES produces, ordering the JCA to study the toxicity of the ashes and to use the results to create and apply new standards. This is still and ongoing process. Project Details AES produces 453 MW. 350,000 tons of coal ashes were deposited in El Coqui Landfill in Humacao. 125000 tons of coal ashes were deposited in Peñuelas Valley Landfill. 250 tons of coal per hour are used for energy production in AES. Affected populations in Tallaboa, Peñuelas and others. Company Names or State Enterprises Applied Energy Systems (AES) from Puerto Rico - Company which produces de carbon ash residues and is in charge of its uses and waste managment. EC Waste Inc (ECW) from Puerto Rico - Propiety of landfills El Coqui Landfill and Peñuelas Valley Landfill. 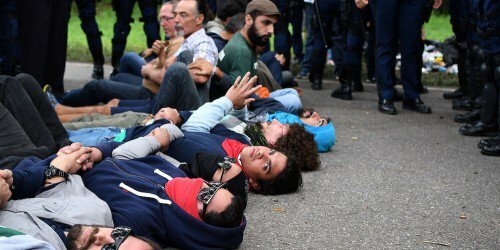 Demonstrators have been repeatedly arrested. Development of Alternatives House of Representatives of Puerto Rico entrusted the President of the Board of Enviormental Quality , and the secretary of the Department of Health that they should determine if the surrounding of both landfills used for the ash deposits are contaminated with heavy metals or any other harmful substance. These results will be used for other legal decisions and implementations. Some politicians argue that the coal ashes should be exported again to the Dominican Republic. Why? Explain briefly. The dumping is still being done, and the JCA has not studied the toxicity of these coal residues for it to be able to establish regulations for the management of these wastes. Supreme Court hearing of the use of Agremax in Peñuelas. List of places in and around Guayama which have deposits of the carbon ash wastes. EC Wastes and Activist, Public Nuisance court hearing. Card with list of municipalities which used Agremax for construction. Press Conference of the Board of Environmental Quality (JCA). Epidemiological study of amount of citizens with illnesses in areas with Agremax. Petitions by EC Waste and Applied Energy Systems to deposit carbon ashes in landfills in Puerto Rico. Criteria For Clasification of Solid Waste Disposal Facilities and Practices. Supreme Court guarantees municipal ordnance. Blockade at the entrance of the Peñuelas Valley Landfill. Measure to eradicate use of Agremax by Luis Berdiel Rivera and Jose Vargas Vidot. Instagram of Herminio Rodriguez, photographer which made a gallery of photos with different artists and politicians with ashes on them to express repulsion on the carbon ash deposits. Video of EC Waste which shows management of the carbon ashes. Police at Peñuelas Valley Landfill. Police present in manifestation at Peñuelas Valley Landfill. Arrest in manifestation. 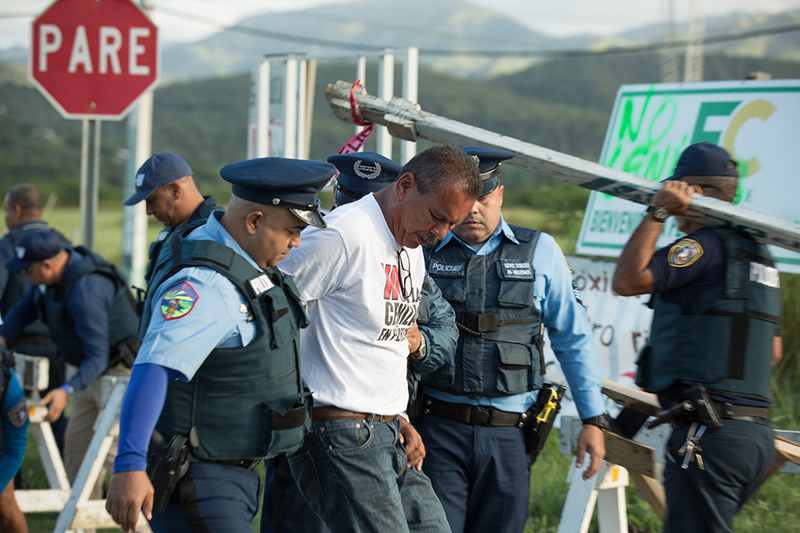 Protestor being arrested at manifestation in front of Peñuelas Valley Landfill. Protestors blocking the street to Peñuelas Valley Landfill. Protestors laying down on the street entrance to Peñuelas Valley Landfill to prevent the entrance of carbon ashes. Prostesters at manifestation against ash deposites. Protester with a banner saying "Stop. No more ashes" with their faces painted like skulls. Maria de Lourdes in the blockad at the PVL manifestation. Maria De Lourdes, candidate of governance, sitting in the blockade. She was arrested that day. March against the carbon ash deposites. A march of protestors against the ash deposits in Peñuelas. Contributor Edgardo G. Nieves Duprey, [email protected], University of Puerto Rico, Mayaguez Campus.